I was just thinking of that. Reading again and hearing again about the outfall, the continuing developing story, the “strange and terrible saga”, the weird turnaround for cannibis sativa on the greatest planet in the solar system, Colorado. How things are going now that Washington State has developed new ideas about right and wrong. And that’s strong, followers. That’s strong medicine. There’s something wonderful about America. I wish someone would figure out what it is. But it’s out there. It’s out there. I remember when a “lid” was seven dollars. $7. It wasn’t bad. It was all right. It was all there was and when you bought your tenth bag you got one free. All the dope was sort of flaky, not sticky. It was Mexican marijuana, unless it was from around Powell River and some of those places where the pot grew like Christmas trees. Thai-stick. This was deadly stuff. You could. You really could. Get interested in throwing a stupid thing like a “Frisbee” for way too long. It came on little four inch bamboo sticks with a bamboo strand holding the goods together. It was good. And it came from a place called “Thailand”. That was an exotic country and you felt cool, and really wrecked, and it was new. Thai-stick was a lot more like the excellent stuff that’s around today. It blew your head off. I mean that figuratively. Figuratively. BC bud. Pretty darn famous as the best. So proud. The beastly bud mostly doesn’t grow in the ground as far as I’ve heard. Never been in a modern grow-op. All I know is I get my stuff from a gentleman who has good stuff. I swear by grass. It’s nice and green. I like the look. There’s nothing like a brilliant patch of green grass in the sun. I feel sorry for all the people who were damaged by the law because of sweet Mary Jane. That’s right. You can talk about absurdities, but if you have to live them, and suffer, Mary didn’t know anything about it. I’m just a plant. A weed, darn it, that grows in the darn ground. I’m not going to jail, or submit to some sort of bullcrap fine. I’m Mary Jane! Are there people still in jail in the great USA for possession of weed? Ah, they probably did more than that. But I remember those fantastical tales of some poor Texan getting 20 years or something for pot. Great, cruel state of Texas. That was the story. Sorry about that, prisoner. Born in the wrong time. Weed shops are growing like bakeries. It does need controlling. But by the good guys. And girls. Time and again it’s been shown that there’s nothing worse than something getting out of control. The anti-weed brigades have retired or died off. They got smoked out. Why couldn’t they realize a lot of things are just a passing fancy? Weed may die out. But it shouldn’t be illegal. “I wonder what they do in there?” Now, come on. 1 hour parking? You gotta be kidding. Oh, oh. I see. It’s just a “dispensary”. I have to check this place out. This entry was posted in Absurdities, Certainties, Stupidities and tagged BC bud, Colorado, Gustav Hasford, Marijuana, Texas, Washington State. Bookmark the permalink. Steve, very hilarious read! I don’t think I even realized “Thai” was even a country back in ‘the day’. 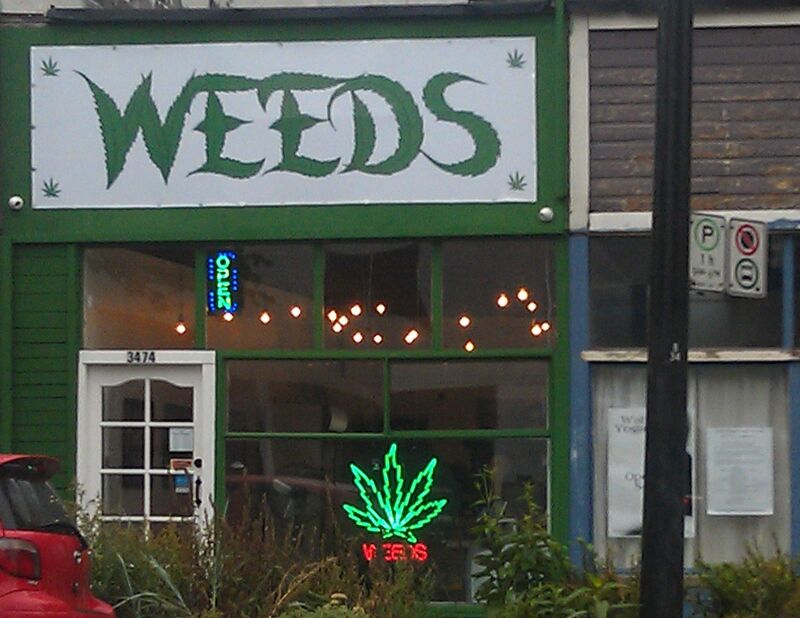 And weed shops seem to be growing like weeds. Pretty soon Tim Hortons will catch on and start partnering up all across Canada for one stop shopping.